What is most amazing about this delicious sheet pan salmon dinner for one is that it was created from a mix of scrappy leftovers! Staring into a very bare fridge the only thing I knew before I started is that I wanted something healthy that would also satisfy my craving for comfort food. I was pretty chuffed this is what I ended up with. Colourful, slightly glamorous and definitely healthy the hero is the parsnip and carrot mash roasted with cumin. Read below how simple this dish was to make and how easy it is to adapt. This dinner is an example of the versatility of sheet pan dinners and that even if you are cooking for one, they are a great option. Combining the salmon with a roasted vegetable mash gave a it the comfort food factor. Adding the pomegranates contributed the glamour and adding a dressing amped up the flavour. I just love that something that looks so colourful and tasted so delicious was created from such a bare fridge and a pretty uninspiring set of ingredients. It really does show the value of 'just starting' and putting your imagination to work. Note: If the last thing you want to do is use your imagination at the end of the day and would like to be more certain that you will have the right ingredients available, but still like this dish, see where salmon has been incorporated into my weekly menu plans. You can use these to plan ahead and help put together your weekly shopping list. This meal is an example of a meal that an be made exactly as I have done, or you can follow the basic steps and adapt it for the ingredients you have available. If you don't have the same ingredients to hand you can follow the basic steps and adapt them base on what is available in your fridge, freezer or pantry - or just what you feel like eating! In the recipe below I note the quantities, but these are approximate. Feel free to use your judgement, e.g. use how hungry you are and how much you feel like eating as your guide as to how much much mash you make, how big a piece of salmon you choose and how much broccoli you have. For instance I am always keen to make sure I get at least 3 - 5 serves of vegetables in any meal, so If am only cooking with 3 vegetables, such as here, I might double up on broccoli and make that count for two serves. 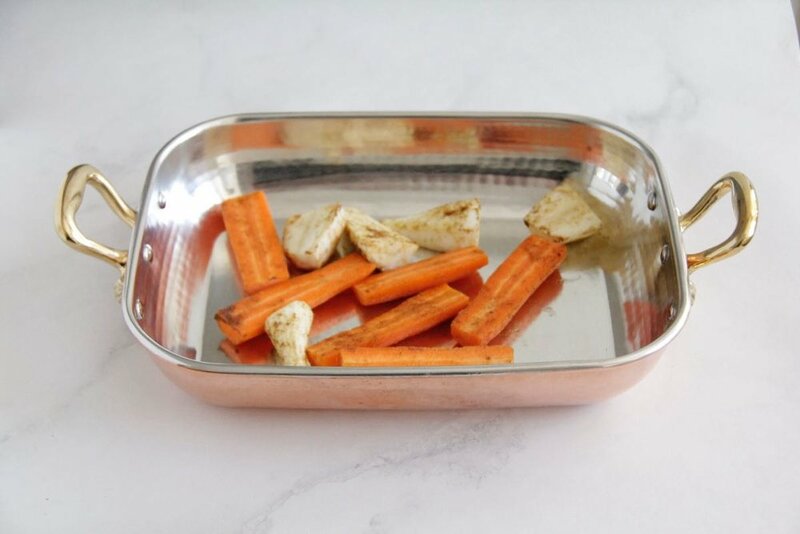 The vegetables that take the longest to cook will go into the roasting pan first. For example in this recipe, the carrots and parsnips take about 40 minutes to roast and the salmon and broccoli take 12 - 15 minutes depending on how well cooked you like your salmon. 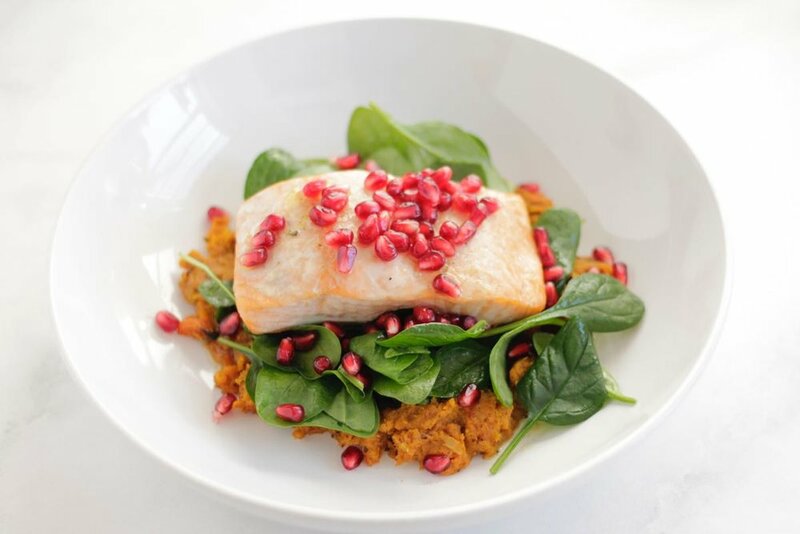 Transfer mash to a plate, pile spinach on top, and drizzle with the dressing, then add salmon and broccoli to the plate then sprinkle over pomegranate seeds. Make dressing. See instructions below. Assemble dinner by putting mash on the plate. Add layer of spinach or greens. Drizzle over dressing. Put salmon on top. Sprinkle over pomegranates and add broccoli to the plate to serve.